This film tried very hard to capture the essence of the comic book. Tried, but failed. Let me try to find some good points, though. Okay, the casting was great, except for Jessica Alba. 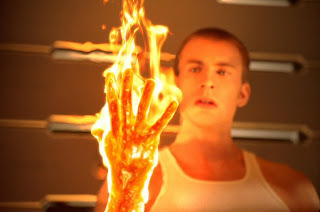 Chris Evans was perfect as the cocky and arrogant Johnny Storm, and Michael Chiklis portrayed The Thing quite close to his comic book persona. Ioan Gruffud seemed to pull off Reed Richards quite well, as he made quite a believable dork. Jessica Alba however, was not even convincing as a scientist. Sue Storm should be smart with a strong personality, and should complement the character of Reed Richards. And this Jessica Alba failed to do. Special effects-wise, it was great, like a typical Marvel movie. But again, effects are merely tools to help propel the story forward. And this film is nothing more than the story of how they got their powers. Big deal. I'm really sorry, but the Christopher Nolan Batman reboot has raised the bar for superhero movies. Any film that falls short will just be popcorn fare. Even if it has Jessica Alba in it. Yeah Jessica Alba as Invisible Girl made me go WTF too. But, I didn't really like the Fantastic Four cartoons growing up, so I didn't really pay attention to the film haha.